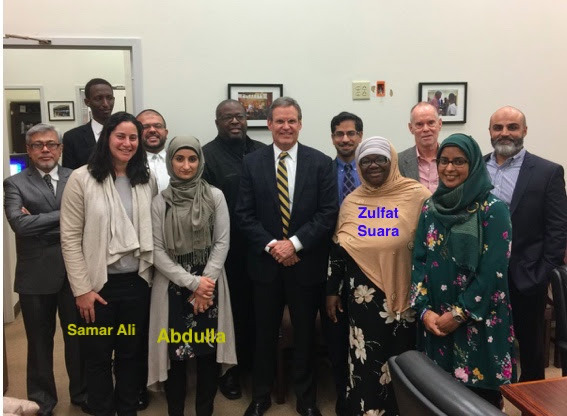 Tennessee’s American Muslim Advisory Council (AMAC), Zulfat Suara who attended the second meeting with Bill Lee, is pictured standing to his left. She is also pictured here standing to the left of renowned anti-Semite Linda Sarsour. 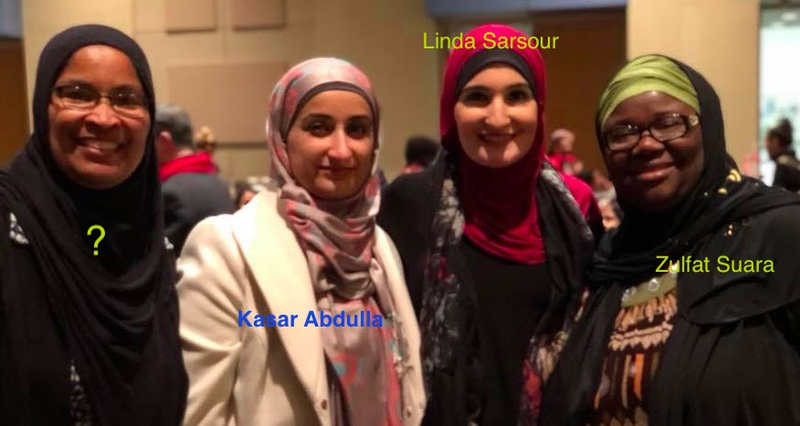 Sarsour so admires Zulfat that when she created the “MPower Change” list of Muslim social justice warriors, Sarsour included Zulfat. Predictably, Zulfat’s list-mates included others with solid anti-Semite credentials including the founder of “Dream Defenders” whose is an admirer of the PLO, an organization known for violence targeting Israeli civilians. The list also includes California CAIR director Zahra Billoo who has aligned herself and her Jew-hatred with Sarsour, earning them the title, Sisters in Hate. Hatem Bazian is also admired by Sarsour and included in the list of 100. Bazian is the leader of the most organized national movement founded on and fueled by hatred of all things Israel and Jewish. He co-founded Students for Justice in Palestine (SJP), the college campus anti-Jew group. Often referred to as “HAMAS on campus” SJP is responsible for annual anti-Israel activities, intimidation activities against Jewish and pro-Israel students, and pushing Israel boycott resolutions. Bazian also founded and chairs the national board of the extreme anti-Israel organization American Muslims for Palestine (AMP) which helps train and support SJP activists like Tennessee American Muslim Advisory Council (AMAC) board member and anti-Semite, Drost Kokoye. You can read more about Kokoye in Part 1 of this series. Bazian’s AMP organization is a member of the larger anti-Jew coalition called the U.S. Campaign for Palestinian Rights (USCPR), run by the former leader of Samar Ali father’s D.C. organization. Tablet Magazine has exposed a troubling money relationship between USCPR and U.S. designated foreign terrorist organizations. Last year ISNA (Islamic Society of North America) presented Zulfat with the Muslim Policy Advocate of the Year award. 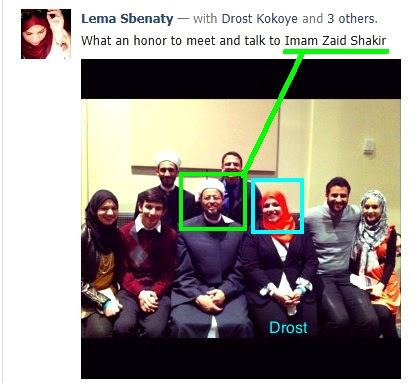 ISNA, like its fellow travelers, promotes BDS against Israel. Speaking at AMP conferences, ISNA’s vice-president Safaa Zarzour says all Muslim organizations should unite behind BDS. Sounds just like the maze deliberately created by the Muslim Brotherhood’s Holy Land Foundation prosecuted for funneling money to HAMAS. 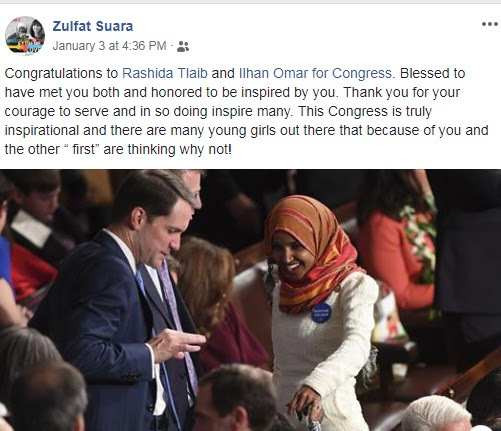 Zulfat Suara’s admiration and connection to Jew-haters like Sarsour doesn’t stop there. Apparently she personally met Muslim members of Congress Ilhan Omar and Rashida Tlaib, both of whom openly support the Boycott, Sanctions & Divestment (BDS) campaign against Israel. Explained extensively in Part 1, the popular pro-BDS genocidal slogan “from the river to the sea Palestine will be free” means no Israel or Jews to exist between the Jordan River and the Mediterranean Ocean. During her campaign for Congress, Ilhan Omar when asked whether she supported BDS, told the audience at the synagogue that she “didn’t think it was effective.” However, after being elected she came out in full support of BDS. In some circles that is called lying. Zulfat has been so inspired by these newly elected Jew-haters, that after completing a training program for Democrat women candidates, that during her speech at the 2019 Nashville Women’s March, she announced her own candidacy for an at-large seat on the Metro Nashville City Council. No doubt Zulfat is counting on getting elected using the ruling Democrat doctrine of identity politics. After all, that is what the “My Muslim Vote” campaign is all about. She has spent plenty of time scoping out the Metro Council and making friends with its members, throwing the AMAC’s support behind the anti-police citizenship oversight board. Zulfat recently moved from Bolivar to a new address at a Davidson County apartment while she waits for her $650,000 house to be built. For 16 years her husband was the Medical Director of the Hardeman County Community Health Center but is now listed as the Chief Clinical Officer for Neighborhood Health. Zulfat, who came to Nashville in 1993, from Nigeria, loves to talk about how Muslim women in the U.S, are “oppressed” and that all women who supported Brett Kavanaugh’s appointment to the U.S. Supreme Court belong in hell. Too bad she can’t work up that much passion to help her fellow women being genitally mutilated in her native Nigeria, the country ranked third highest globally for mutilating women. Bill Lee justifies his meeting with AMAC because he says he represents all Tennesseans. Having already met with AMAC twice, maybe Lee should consider setting aside time to meet with some other Tennesseans he also represents.